Hare Cottage is a truly gorgeous 5 Star Gold two-bedroom luxury holiday cottage set in a pretty little village in Wensleydale. Breath-taking views from every room, a cosy wood-burner to curl up in front of and a fabulous wood-fired hot-tub looking out over the Wensleydale steam trains. Oh, and an excellent foodie pub just a few hundred yards away. If you’re looking for a Yorkshire Cottage with wow factor, Hare Cottage is the one. Set looking out towards a picturesque valley in the Yorkshire Dales, this beautiful holiday cottage has been lovingly designed to make your stay as comfortable and relaxing as possible. Soft warm blankets on the sofa, underfloor heating beneath wooden floorboards, wood in the basket, large picture windows framing that view. Every little detail is pitched just right. There is also an LCD TV with Freeview & NetFlix, a DVD Player and Wi-Fi to keep you entertained. The kitchen has every modern convenience you could wish for, from a dish-washer and washing machine to a Nespresso coffee maker and iPod docking station. Pop on your favourite album, whip up some coffee, grab the Sunday paper and chill… And in the cupboards you’ll find Denby crockery and an excellent selection of cooking utensils. Hare Cottage has been awarded 5 Stars for Family-friendly and Pet-Friendly provisions. The owners can also provide a number of additional services for you like laundry, cleaning and business services. Please note this property requires payment of a security deposit. Hare Cottage has an idyllic location in the Yorkshire Dales. Set in an elevated position looking out onto the lush green pastures of Wensleydale, there are amazing views to be had in every direction. And if you are a bit of a foodie, the local village gastro pub is just a stone’s throw away. Hare Cottage also has lots to offer families. The large enclosed garden is perfect for little ones to run around in safely and there is also a generous play area next door with a variety of outdoor toys to keep them happy. The paddock to the rear of the cottage is home to Shetland ponies, and the kids will love coming out to say good morning every day. The owners can also provide you with prams and bikes if required. And just down the hill there is a tiny rural train station where you can hop aboard the Wensleydale steam trains. Heaven for kids and rather delightful for adults too – jump on and head up to Leyburn for lunch before taking the train back home again! There's also a gold course just down the hill from the village too. Beyond the village the attractive town of Bedale is worth a visit. Stop for a coffee before making your way around the town’s antique shops. 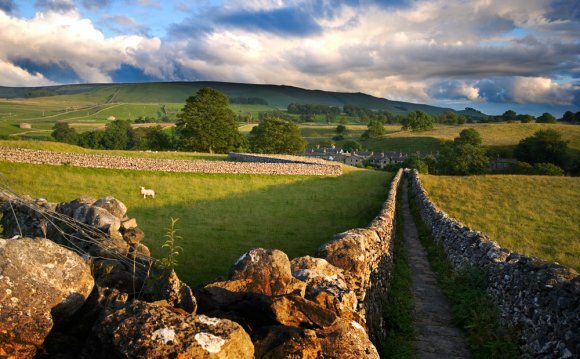 In the opposite direction you’ll find the charming market town of Leyburn. Leyburn is an archetypical slice of Dales market town life. You’ll find traditional shops, pubs and cafes all gathered around the handsome town square, which hosts a busy market every Friday. Leyburn is also home to the biggest auction centre outside of London if you fancy picking up a bargain. The nearby historic town of Richmond is similar in many ways, and has a lovely setting along the River Swale. There are lots of other pretty villages and stunning natural sights all within close range of Hare Cottage. Aysgarth Falls and Bolton Castle are just a few miles away and the gorgeous villages of West Burton and Askrigg are within easy driving distance, so lots of choice for things to do if you want to get out and about. If walking is your thing, the Yorkshire Dales are something of a walker’s paradise and you can strike out from the door of this luxury Wensleydale cottage. And there are plenty of options for cycling too in Tour De France country. Our concierge will be more than happy to recommend some walks and cycle routes for you if required. And when you need to refuel stop at one of the areas many excellent gastro pubs. Our favourites include the Wensleydale Heifer in West Witton, the Blue Lion at East Witton and of course the Wyvill Arms just along the road.